In 1957, Henri Jeanneau, already passionate about aeroplanes and automobiles, had just discovered a brand new passion for powerboating, one that began as he watched a boat pass by his window. Soon afterward, in Les Herbiers, France, home to a rich heritage of artisan work, he began building a wooden hull with which he participated in the 6-hour Paris race, the largest national race at the time. He was first to cross the line, and this galvanized him. So, a past time became a trade. The shipyard built its first fibreglass hull. This new material, a petrochemicals product, created a technological breakthrough without precedent. The Jeanneau shipyard produced the first sailboats, with the Alizé, a true success. This year marked the beginning of the “democratisation” of sailing, and boat production went up. JThis same year, Jeanneau launched the fabulous Love Love and the Sangria. This last model was a huge success, securing Jeanneau’s position as a market leader in the design and construction of liveable sailboats. 3,000 boats were sold. JEANNEAU ENTERS A SINGLE-HANDED TRANSATLANTIC RACE WITH A MELODY helmed by Yves Olivaux. This significant event demonstrated, quite simply, that a production model boat could be sailed across the Atlantic, single-handed, just as Eric Tabarly had done. THE JEANNEAU SHIPYARD TAKES PART IN POWERBOAT RACING alongside the company, Transports Graveleau. For several seasons, the Formule 1 Inshore or Formule 3000 (1984) catamarans, helmed by Michel Rousse, would dominate the competition with their more solid, Kevlar hulls. The spirit of the Cap Camarat line was born with the Cap Camarat 575 . Called “the 4 x 4 of the seas,” its seafaring qualities were such that that it became legendary. Today, the Cap Camarat line has become an international reference in powerboats for sport and leisure. Jeanneau won the first 3 places in the Nyamey-Bamako Rally, a test of endurance covering 2,000 km. Specially constructed of Kevlar, the Cap Camarat Niger 510 was the big winner of this African adventure, with Gérard D’Aboville. This same year, the Club Med chose Jeanneau to resupply its fleet of powerboats for water skiing. Between 1982 and 1998, Jeanneau was the exclusive supplier for the Sailing “Tour de France”, with 3 generations of sailboats: Rush Royale was replaced in 1984 by the Selection . CREATION OF JTA (JEANNEAU TECHNIQUES AVANCÉES) Constituted by men and women passionate about competitive sailing and high-tech construction, this workshop developed some 50 prototypes, all high-tech race boats: Formula 40s, maxi-multihulls, 60-foot trimarans, One Tonners, as well as boats for The America’s Cup, The Globe Challenger, etc. Launched in 1983, the Sun Kiss quickly becomes a reference among large cruising sailboats. Construction of the “Fleury Michon 7,” the largest catamaran ever built at that time, was a product of the beautiful relationship between Fleury Michon, Jeanneau and great skippers, such as Philippe Poupon. The Fleury Michon 8, 9, 10 et 11 would win numerous titles, including the Route du Rhum (single-handed transatlantic race) in 1986 and the transatlantic sailing record in 1987. Jeanneau cements its international leadership in the world of powerboat racing, beating world records for speed with a production model engine (170.21 Km/h) and for endurance over 24 hours. Jeanneau accumulated victories in the 24-hour race of Rouen four times, in the 6-hour race of Paris, as well as in Great Britain and in Singapore. Birth of the 1st PRESTIGE designed by Garroni Design. She immediately won hearts with her contemporary style and exceptional seaworthy qualities. This launch signalled Jeanneau’s arrival on the market of luxury motor yachts. Today, over 2500 PRESTIGE motor yachts cruise the seven seas. Aboard her “Groupe Pierre 1er” trimaran, Florence Arthaud completed an incredible race and was first to finish, ahead of Fleury Michon and RMO. It was a triple win for Jeanneau, who built all three boats on the podium. The Jeanneau One design (JOD) replaced the Sélection as the official boat of the Sailing Tour de France. Two replicas of “Pierre 1er” were produced to meet the enormous production needs of the American film, “Waterworld,” with Kevin Costner. The first Sun Fast made its debut with the production of the Sun Fast 52, a Jeanneau racer-cruiser sailboat designed by Philippe Briand in collaboration with Philippe Poupon. Chantiers Jeanneau joins Bénéteau. This is also the year that Microcar (licence-exempt vehicles) and Lagoon (catamarans) join the group. Creation of Jeanneau America in the United States. With the Sun Odyssey line, the 2000s would see dynamic growth in a line of sailboats featuring signature Jeanneau qualities : elegance, comfort, innovation and seaworthiness. Our site dedicated to the construction of large Jeanneau models is expanded. Jeanneau would now have the world’s largest shipyard for the construction of production-model boats, extending over 40 hectares. Creation of the Asia Pacific Jeanneau subsidiary in Hong-Kong. 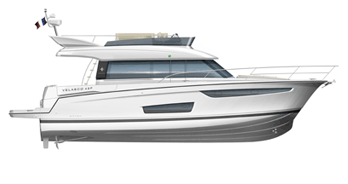 JEANNEAU ANNOUNCES THE 18TH SUN FAST MODEL with the new Sun Fast 3600. Without a doubt, this new sailboat is a fine addition to an impressive family line! DONGFENG RACE TEAM, FOR WHOM JEANNEAU IS THE OFFICIAL SUPPLIER, represents China in the Volvo Ocean Race. JEANNEAU OFFERS THE FIRST PRODUCTION YACHT OVER 60 FEET: THE JEANNEAU 64 ! It is an audacious move made possible by the experience and capabilities of the Jeanneau team, and one that has been very well received by customers. Customer loyalty continues to be an essential source of our motivation, enthusiasm and confidence, and has been since 1957. JEANNEAU, LEADING THE RACE The Sun Fast line dominates the podium in 3 out of 4 divisions, and 10 are among the top 12. Such beautiful results for this line that combines speed, performance and technology! Jeanneau has become a key player in the market of inboard powerboats. We are continually renewing our product offer and creating new product lines that immediately find their audience: the Leader, Velasco and NC lines each offer their share of innovation.